Do you remember the big comeback of maxi skirts? It was impossible to meet a girl in a short or midi skirt, as everyone appeared on the streets wearing cool maxis. I decided to share with you some of my favorite tips and ideas on how to make maxi skirt look great on you. No matter if you are petite, tall, curvy, skinny or plus sized, everyone can rock this trend and look good, all you need to know is how to style it correctly. This is a must-have piece for spring and summer seasons, but I see lots of ladies wearing it in cold months. Anyway, we are here to talk about Summer, that's why I suggest to scroll down and see all my favorite outfit ideas to get inspired by. Pastel floral maxi skirt is paired with a simple cream-white tank top and pastel blue heeled sandals. Why this fashion staple is so popular? It's versatile, easy to style and incredibly comfy. This go-to fashion essential can look awesome on every body type. Believe me, maxi skirt is very easy to wear on your casual days, weekends, as well as special occasions. Lots of things depend on your personal taste, as you can choose flowy or curve-hugging maxi skirt. I think these skirts should have a place in every woman's wardrobe. All you need is the right top to look great in your lovely maxi skirt. No matter where you go, be sure maxi skirt will make you look awesome. It's easy, breezy and feminine. If you didn't buy one yet, then you still have time. 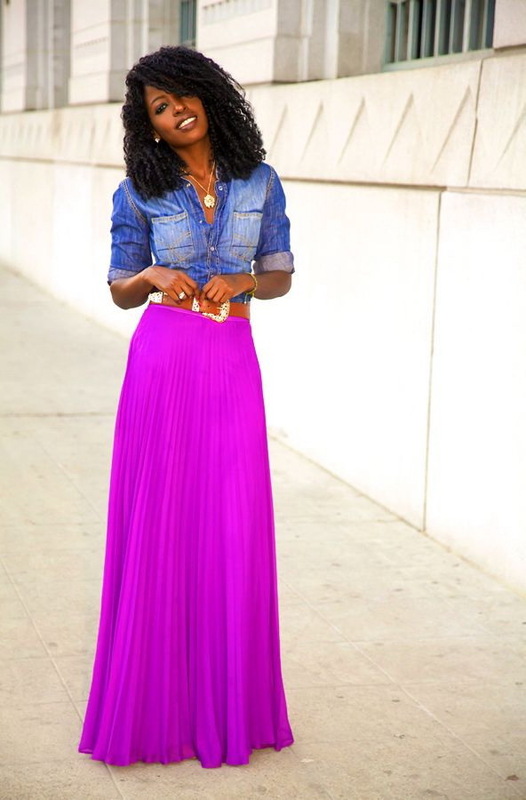 Before you go shopping, here are shown style tips on how to wear maxi skirt in summer time. Hope you like these street style ideas the same as me.